Washington D.C. is burning, blowing up before SSA Ellie Conway’s eyes. More than ever she needs her controversial connections to prevent more terror attacks and horrifying deaths. Surveillance footage mysteriously wiped away, explosions rocking the city, people blown apart, an insider forging Ellie’s signature to release suspects, and her helicopter taken down, all challenge Delta A to find the link between the terror attacks, international trade in missing girls, coded price lists and a rogue Interpol agent. 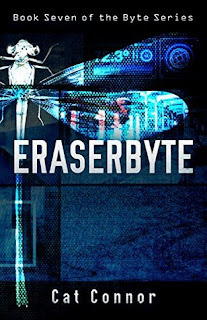 ERASERBYTE is the seventh in the "byte" series from New Zealand author Cat Connor. The characters are all part of a crack team of special agents, operating out of Washington DC, led by Ellie Conway. Conway is a classic all-action hero, capable of absorbing massive amounts of physical punishment (including injuries in a helicopter accident), and just keep on keeping on. There's romance, and the extra twist of visions, and a psychic in-head connection with the new man in her life. Having managed to come to this series originally with DATABYTE (which I think is the sixth overall), I will admit it left me more confused than anything else. This is a cast of characters, and a scenario, that take some getting to know. Given that it's a series that's big on action, it's pleasing that there is a strong concentration along the way on characters, and in particular, how the team work together. Which means it's likely that this is a series that you're really going to have to read in order to fully appreciate. It was marked how much better the experience was with ERASERBYTE than it had been with the earlier book for this reader. Having said that, you are also going to have to be okay with the whole paranormal visions and the speaking inside each other's head connection between the two love interests. It's possible to work around it if, like this reader, you're hard to please with that type of approach, but it is prevalent and might feel slightly out of place given the rest of the high-action, high-threat aspects of the stories. There's also something slightly unexpected about these characters who joke, rib and tease each other mercilessly, and are closely bonded enough to be capable of light-hearted banter in the middle of extreme circumstances. Their informality appeals to a Southern Hemisphere dweller, whilst also making you wonder a bit about the more buttoned down, formal and very controlled agents of much American storytelling from a similar environment. Having now read two books in the series it's definitely making much more sense, and allows for some of the "what the" moments to flow more easily. One for fans of high-threat action, who would appreciate a strong female central character, don't mind a hefty dose of romance and that spot of paranormal into the bargain.